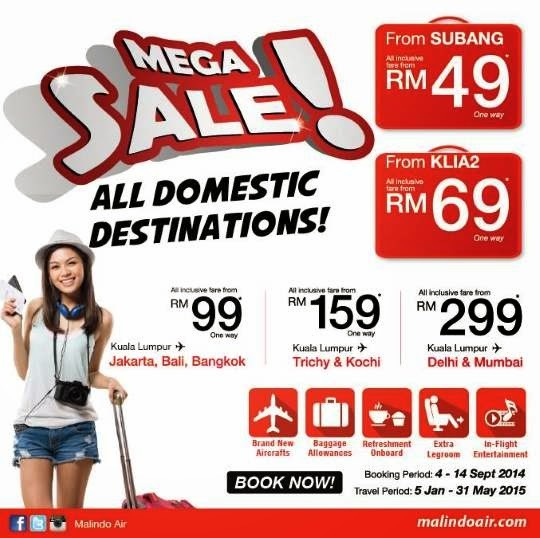 Browse » Home » Thailand » Malindo Air Mega Sale: Malaysia Destination from RM49! Malindo Air Mega Sale: Malaysia Destination from RM49! All domestic destinations on MEGA SALE! Fly from Subang to any Malindo Air's domestic destination from just RM49 (all inclusive fare)! Fly from KLIA2 to any Malindo Air's domestic destination from just RM69 (all inclusive fare)! Fly from Kuala Lumpur to Jakarta, Bali, Bangkok with all inclusive fare from RM99 (one way). Fly from Kuala Lumpur to Trichy & Kochi with all inclusive fare from RM159 (one way). Fly from Kuala Lumpur to Delhi & Mumbai with all inclusive fare from RM299 (one way).